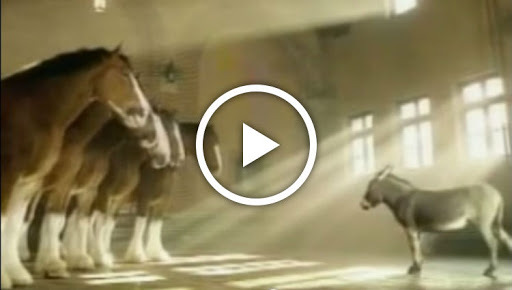 Donkey Stands In Front Of Five Majestic Clydesdales, His Next Move Will Leave You In Stitches! A donkey wishes to be a Clydesdale horse starring in a Budweiser commercial. However, he is a donkey and not a horse, so this may be problematic to him. He is smaller and lacks the distinctive extra hair around his hooves. He adorably tries “hair extensions” on his lower legs to make his appearance more like that of a genuine Clydesdale horse. Oh, how he wants to be a Budweiser horse and walk proudly with the other Clydesdale horses in a commercial. So one day, he gets an “interview” for the job. He stands before an array of several majestic looking Clydesdale horses. He is “asked” why he wants to join them. He then whinnies loudly. Suddenly he appears with the group of Clydesdale horses proudly walking beside the ones in front. He is happy and proud and doesn’t understand fully how he “made the cut”. However, thinking back, he thinks “I’ve must’ve said something right!”. This ad is very cute and subtly shows how acceptance is important to groups.SHARE AWAY! !